Interpol (The International Criminal Police Organization) has requested the arrest of the spiritual leader of the Muslim Brotherhood and global Sunni Islamist diaspora, Sheikh Yusuf al-Qaradawi, whose radical past includes praising suicide bombers against innocents as martyrs and describing Nazi leader Adolf Hitler as Allah’s gift to the world. Interpol is charging the terror Sheikh with agreement, incitement, and assistance to commit premeditated murder, facilitating a prison escape, arson, vandalism, and theft. 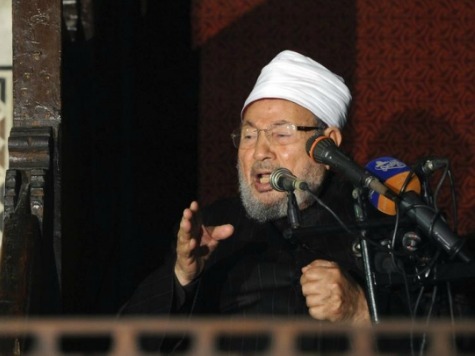 The Muslim Brotherhood spiritual leader has recognized suicide bombings against Israeli civilians as “martyrdom operations.” “the one who carries out a martyrdom operation [suicide attack] has a clear goal, and that is to please Allah,” explained Qaradawi in a speech to the European Council for Fatwa and Research. In 2004, Egypt’s Muslim Brotherhood offered Qaradawi their top leadership position, which he would end up turning down due to health issues. The Al Jazeera news network, which has established offices in most of America’s major cities, has been broadcasting Qaradawi’s “Shariah and Life” television program for over eighteen years. The Sheikh’s TV show has an estimated viewership of 60 million people. A search on Al Jazeera’s English site has found that the news network has not reported on Interpol’s charges against Mr. Qaradawi. Qaradawi is believed to be living comfortably in Qatar, a country which has been frequently accused of sponsoring terror groups such as Al Qaeda and the Islamic State. It remains unclear whether the Obama Administration will follow suit with more and more leaders in the international community and declare the Muslim Brotherhood a terrorist organization. The UAE, Egypt, and Saudi Arabia have all designated Qaradawi’s MB as a terror group.